WHY LIVE ART, WHY NOW? is an annual conversation situated as part of Live Collision International Festival taking the shape of discursive events and podcasts exploring the dialogical and thematic space created by ‘Live art’; examining why Live Art is both vital and urgent as an art form in our current cultural, social and political climate. The art form itself challenges conformist conventions through its form and subject matter(s) by embracing risk and taboos. While simultaneously creating a space for artists and works of art that sit outside the margins of mainstream culture. 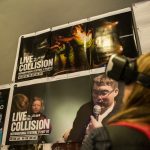 Live Collision 2018 will host a podcast series featuring the change makers, policy breakers & cultural shakers of our time. Critical thinkers who traverse the mainstream and the radical undergrowth to dig deep and excavate the imperative discursive power of articulation and action with influences ranging from the surreal to the hyper-real to the everyday. Our Podcast series hopes to deliver all this and more. Join us and our Festival Guests on this podcast journey peppered with a curiosity or two. The first series of podcasts will feature artists from the festival programme and they will be published and ready for your listening post the festival. Please stay tuned for information on their release.